Spring weather is finally making an appearance and we've got baseball fever! Don't forget to get your Cardinals tickets to the game vs. the Pirates on May 11th! Tickets are going fast and you don't want to miss out on a fun day at Busch Stadium with your family! The seats are in the 200 Loge Field level and retail at $58. This fundraiser helps support Explorer athletic programs. 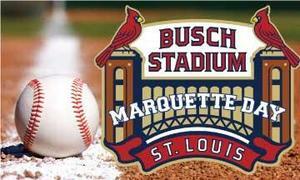 You can purchase tickets from the Development Office or you can order online at www.marquettecatholic.org/cardinals and pick up from the Development Office. Feel free to go to Marquette's facebook page and share this event, encouraging friends to put your child's name down as the seller. See you at the Ballpark!